Usually, we get to see fruits like plums, melons, oranges and cherries on a three reel slot. But now we have few sites that have started featuring such summer fruit themes on their video slots too. Such themes are released for promotional reasons, usually in the summer season, to attract more players. Following that trend, Blackjack Ballroom has recently declared new promos for its fruit-themed games. Wow Pot and Fruit Fiesta have these summer fruits as their theme.Â Last year, a player named S.B won the progressive jackpot of 29,141 dollars playing Wow Pot. 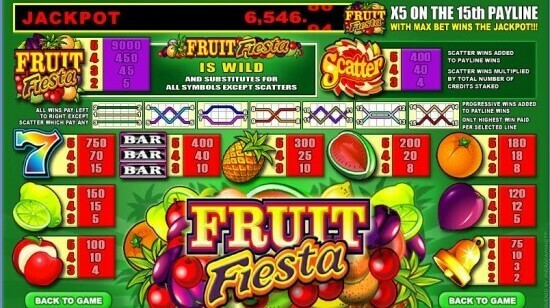 Now, in June 2012, the same player has hit a bigger jackpot of 33,852 dollars on Fruit Fiesta. Blackjack Ballroom casino said that it promoted these two games because it wants its members to play these games and win big like S.B did. On June 23 and 24,Â the site ran its first endorsement on Wow Pot. The gambling site encouraged its players to try their luck with this game. It also said that around ten lucky players would be chosen randomly and offered 100 dollars everyday till the promo ends. The Wow Pot is famous for its easy game play. The game has orange, cherries, lemon, melon and plum as its symbols. The prize pool is offered if players get 5 Wow Pot logos when they reach the fifteenth payline, with bets of 1.50 dollars. The value of the pool was 10,000 dollars. The game marks a hit frequently, making it possible for players to win easily when they are trying for their promotional prize. Fruit Fiesta promo on the other hand, was open from June 23 to June 28. A 100 dollar cash prize was given to the top 5 wagerers every day. The symbols that are crafted in Fruit Fiesta are more attractive and realistic when compared to Wow Pot. Fruit Fiesta includes cherries, pineapple, orange, lemon, melon and plum. But players have to look out for Fruit Fiesta symbol closely to win. Prize pool will be considered a hit only if players get 5 Fruit Fiesta symbols on 15th payline. Fruit Fiesta had better rewards when compared to Wow Pot, even with a total bet of 0.75 dollars for every spin. The website’s newsletter said that the maximum amount that players could win was an impressive 157,438 dollars, with an average pool of 22,000 dollars. The value was about 11,000 dollars which increased very quickly due to the addition of millions of players every day. Blackjack Ballroom is the largest brand of Casino Rewards Group, which is maintained by the software provided from Microgaming. The site, established in 2007, is regulated by Kahnawake Gaming Commission.